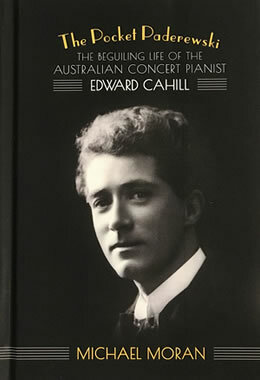 The glamorous concert pianist Edward Cahill (1885-1975) rose to prominence from humble beginnings in the inauspicious setting of 19th century rural Queensland. At a time when Australian concert artists were relatively unknown in Europe, he dazzled the salons of royalty, aristocratic patronage and privilege in London, Paris and the French Riviera during the glittering decades of the 1920s and 1930s. His baptism by fire in the travelling silent cinema of the outback, music hall and vaudeville was a surprising grounding for a concert pianist. Yet he became a protégé of Dame Nellie Melba and played for Kings in Southeast Asia and Maharajahs in India. 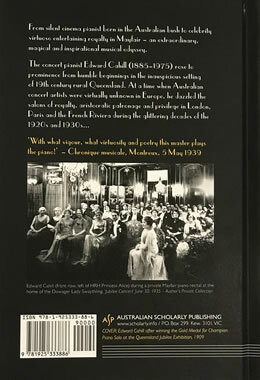 Cahill performed for Queen Mary in London and for the Duke and Duchess of Windsor in Paris. Invited for lessons by the visionary pianist Alfred Cortot, he was known to the great conductor Wilhelm Furtwängler, the pianist and statesman Ignacy Paderewski and the composer Percy Grainger. In London, Cahill gave some of the first recitals in the modern revival of the harpsichord. His concert tours of Nazi Germany tragically sundered an intense romance and musical partnership with the beautiful Austrian Jewish violinist Sabine Adler. After spending the war years in Switzerland giving charity concerts for interned troops, he took a courageous stand against apartheid as a resident of South Africa, passing his declining years in Monaco. The search for the enigma of ‘Uncle Eddie’ has been a rich family quest. As a musician, I was fascinated by this charismatic figure, the legend who loitered in the shadows of inherited memory. Set against the dramatic backdrop of the age, this historical biography is a portrait of the prodigious musical gifts, infectious charm and unswerving determination that transported the pianist Edward Cahill from pastoral isolation to brilliant European stardom. Michael Cathcart on ABC RN produced a 20 minute radio segment on Edward Cahill.